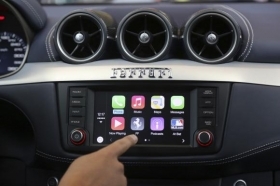 Apple displayed the CarPlay program at a conference in San Francisco last June. SAN FRANCISCO (Reuters) -- A year and a half ago, Apple Inc. had applied for just eight patents related to auto batteries. Recently, it has hired a bevy of engineers, just one of whom had already filed for 17 in his former career, according to a Thomson Reuters analysis. The recent spate of hires and patent filings reviewed by Reuters shows that Apple is fast building its industrial lithium-ion battery capabilities, adding to evidence the iPhone maker may be developing a car. Quiet, clean electric cars are viewed in Silicon Valley and elsewhere as a promising technology for the future, but high costs and "range anxiety," the concern that batteries will run out of power and cannot be recharged quickly, remain obstacles. Those challenges could also be seen as opportunities to find solutions to take the technology mainstream. The number of auto-related patents filed by Apple, Google Inc, Korea's Samsung, electric carmaker Tesla Motors Inc. and ride-sharing startup Uber tripled from 2011 to 2014, according to an analysis by Thomson Reuters. Apple has filed far fewer of these patents than rivals, perhaps adding impetus to its recent hiring binge as it seeks to get up to speed in battery technologies and other car-building related expertise. As of 18 months ago, Apple had filed for 290 such patents. By contrast, Samsung, which has been providing electric vehicle batteries for some years, had close to 900 filings involving auto battery technology alone. The U.S. government makes patent applications public only after 18 months, so the figures do not reflect any patents filed in 2014. Earlier this month, battery maker A123 Systems sued Apple for poaching five top engineers. A search of LinkedIn profiles indicates Apple has hired at least another seven A123 employees and at least 18 employees from Tesla since 2012. The former A123 employees have expertise primarily in battery cell design, materials development and manufacturing engineering, according to the LinkedIn profiles and an analysis of patent applications. A123, which filed for bankruptcy in 2012 but has since reorganized by China's Wanxiang Group, supplied batteries for Fisker Automotive's now-discontinued hybrid electric car. "Looking at the people Apple is hiring from A123 and their backgrounds, it is hard not to assume they're working on an electric car," said Tom Gage, CEO of EV Grid and a longtime expert in batteries and battery technology. Apple is building its own battery division, according to the A123 lawsuit. Apple did not immediately respond to a request for comment. The lawsuit reflects how lines between the auto and tech are blurring as Silicon Valley companies from Google to Tesla begin to encroach on Detroit's turf, while automakers develop "connected" vehicles that incorporate the latest applications and Internet services. So far, sales of pure electric cars in the U.S. and globally are still a tiny slice of a market dominated by internal combustion vehicles. However, Apple and other companies looking to develop electric cars could see opportunity in government mandates and incentives designed to boost sales of vehicles that do not emit carbon dioxide. Among those Apple hired from A123 is Mujeeb Ijaz, its former chief technology officer who also worked at Ford Motor Co. for 16 years. Ijaz has filed for 17 patents during his career, many in the battery sector, according to the Thomson Reuters analysis. All told, the five engineers from A123 have filed for 23 patents -- some three times what Apple has alone, Thomson Reuters reports. They generally specialize in battery cell and materials design, and manufacturing engineering. Ijaz was also sued by A123, which said he breached his agreement with the battery maker by going to Apple and recruiting other A123 engineers.